The scope of the Delta Bike Project (DBP) continues to expand. Originally a gathering of friends who would listen to music while working on their rides, the cooperative has grown to be a major inspiration for the future of alternative transportation in Mobile. DBP has joined with two other area charities in its latest endeavor. 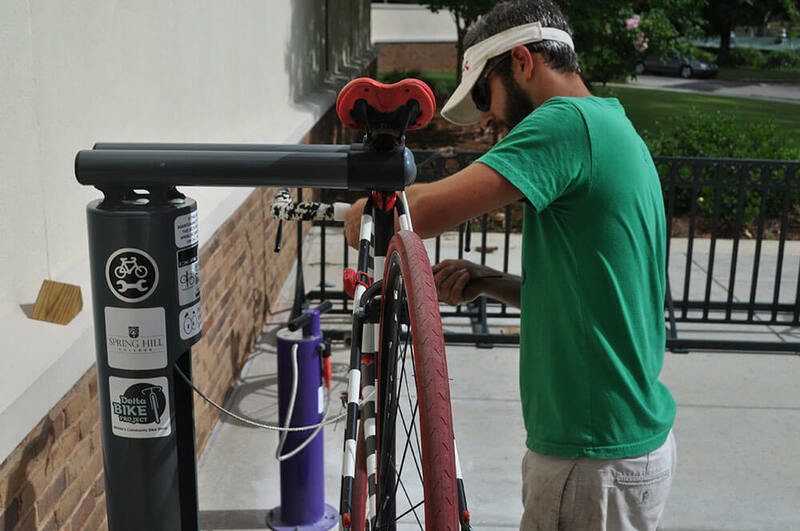 The groups have installed four bicycle fix-it stations throughout the city. 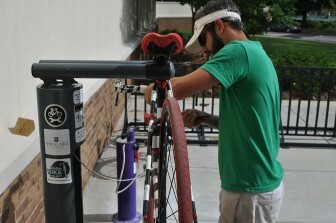 (Photo/Lagniappe) Thomas Carpenter of the Delta Bike Project demonstrates newly installed fix-it stations. 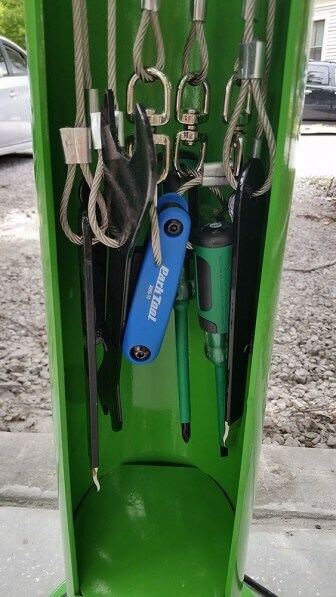 DeQuattro was on a business trip with The Nature Conservancy in Punta Gorda, Florida, last October when he saw his first fix-it station during a “team building” bike ride. DBP approached the Gulf Coast Resource Conservation and Development Council about the plan and received a $5,000 grant. DeQuattro then asked the One Mobile group if they had any funding suggestions, and the organization matched the $5,000. This allowed for the purchase of four fix-it stations and tire pumps. The units come with a repair stand to hold the bikes, along with tethered tools that include Allen wrenches, screwdrivers and tire levers. The tire pumps have pressure gauges to help riders adjust the amount of air in their tires. Each fix-it station displays a Quick Response (QR) Code, which a rider can scan with a smartphone to learn how to do basic bicycle repairs. • Cream & Sugar coffee shop, 351 George St. in the Oakleigh Garden District. “It has been great to have people send us cell phone photos of kids and avid riders using these stations,” DeQuattro said. “These bikes are also the main transportation for many people downtown, so it is great to drive by our building and see people using it every day. “There is also a lot of use at the 15 Place location. Cream & Sugar has seen a good deal of use, and I am sure Spring Hill will get busy with school back in session,” DeQuattro said. The results have been so positive that DBP is already planning to add more stations. The main obstacle is funding. DeQuattro is also the chairman of the Crepe Myrtle Trail project, which hopes to have a bicycle and running path stretch from downtown to the mouth of Dog River. This is a link in Mobile’s Greenway Initiative that stretches along Three Mile Creek to the University of South Alabama. To learn more about the DBP, contact DeQuattro at 251-272-9644 or at jdequattro@deltabikeproject.org. DBP’s downtown shop is open Sundays from noon to 5 p.m. and Tuesdays from 6-9 p.m. In addition to repairs, a wide variety of used bicycles are for sale to fund the nonprofit initiatives. The Gulf Coast RC&D Council (www.aarcd.net) is one of nine such groups in Alabama with the goal of protecting, enhancing and developing the state’s natural and human resources. One Mobile (www.onemobile.org) is a nonprofit organization working to encourage ideas to enable a community-powered future for the city. • The 15th annual Youth Dove Hunts begin Saturday for Mobile and Baldwin counties. 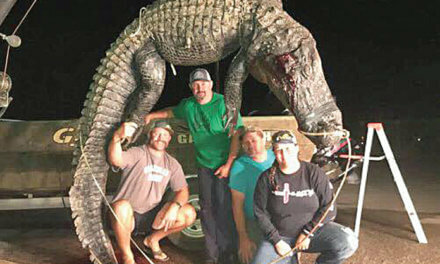 Participants must be 15 or younger, and be accompanied by an adult at least 25 years old or a parent who holds a valid state hunting license and a Harvest Information Program stamp. Although the hunts are free, pre-registration is required. For more information, visit www.outdooralabama.com or call 334-242-3469. • Cole Billingsley, a center fielder for the University of South Alabama (USA), excelled this summer in the Cape Cod Baseball League. As a member of the Yarmouth-Dennis Red Sox, he earned a spot in the all-star game after finishing tied for first in the league in triples (2), ranked second in hits (51) and runs scored (26), tied for second in doubles (11) and finished 15th in batting average (.293). His team won the league championship as Billingsley had a home run and three RBIs in the title game. 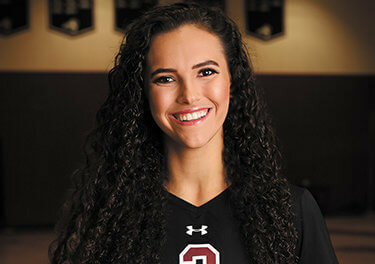 He was a first-team all Sun Belt Conference performer as a USA sophomore. • The Hurricane Junior Golf Tour is returning to Lower Alabama. The Mobile Junior Classic will be September 26-27 at the Lakewood Golf Course in Point Clear. For more information, call 904-379-2697 or visit www.hjgt.org.